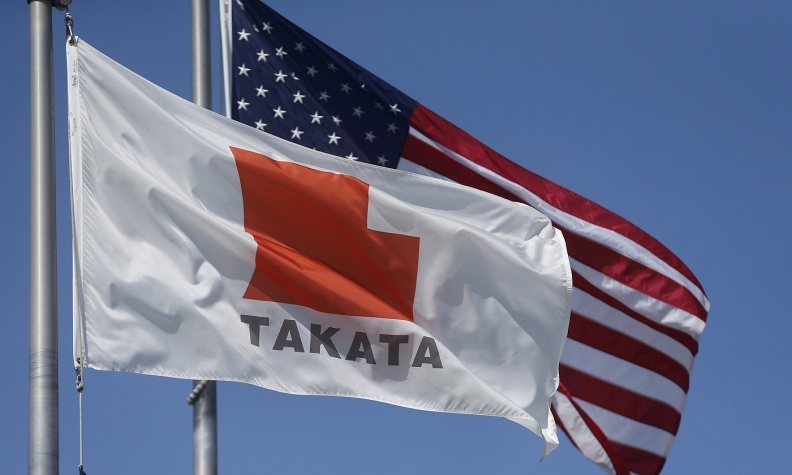 WASHINGTON -- Following Takata Corp.’s admission last week that its defective airbags were in millions of U.S. vehicles, Fiat Chrysler will add more than 1.8 million vehicles vehicles to its Takata recalls while Ford will add more than 950,000 to its campaigns. American Honda also is adding roughly 350,000 to its recall. The three companies are the first automakers to expand recalls after Takata declared airbag inflators in some 34 million vehicles were defective, roughly double the number that had been recalled to date . The parts can explode in a crash and spray vehicle occupants with metal shards. The defect has been linked to six deaths and more than 100 injuries. FCA said in a statement that it will widen a previous recall for driver-side Takata airbags by 1.4 million vehicles to 4.07 million. The expansion covers vehicles from additional model years that need to be recalled, in addition to variants of the Ram pickup and Sterling Bullet commercial trucks not covered by the previous recall containing airbags that were deemed defective by Takata last week. FCA also said it would recall an additional 437,947 Ram pickups from the 2003 model year for passenger-side airbags made by Takata. The latest recalls bring the total number of affected FCA vehicles to 5.22 million worldwide, the automaker said. The company said it is unaware of any injuries or accidents involving the additional vehicles. “FCA US vehicles are no longer produced with either suspect inflator. These components also are distinct from Takata inflators cited in fatalities involving other auto makers,” the automaker said in a statement. FCA’s 4.07 million-vehicle driver-side campaign includes vehicles covered by its 2014 recall for Takata driver-side airbags, including those that received replacement inflators under that campaign, according to company filings with NHTSA. Separately, Ford Motor Co. said it will expand an existing recall of about 539,000 vehicles equipped with passenger- and driver-side Takata airbags to cover a total of 1,509,535 vehicles. The expanded recall covers 2005-2014 Mustangs built at the Flat Rock Assembly Plant, 2005-2006 Ford GT vehicles built at the Wixom Assembly Plant, 2004 Rangers built at the Edison Assembly Plant and 2004-2006 Rangers built at Twin Cities Assembly. The expansion of this recall brings Ford's tally of Takata-related recalls to 1.5 million vehicles. Of the 1.5 million affected vehciles, 1.49 million are in North America, including 1.3 million in the U.S., 93,207 in Canada and 16,953 in Mexico. Ford is aware of one injury possibly related to the faulty airbags, but has yet to see any other inflator ruptures in its vehicles on the road or in testing. American Honda said it would add about 350,000 Civics from the 2005 model year and 2006-07 Accords to its recalls for passenger-side Takata airbags. Even though Honda has been most exposed to Takata’s defect, most of the airbag inflators covered by Takata’s defect reports to NHTSA last week have already been included in previous Honda recalls and “safety improvement campaigns,” the automaker said in a statement. Unlike FCA, which is seeking to replace airbags used in previous Takata recall repairs, Honda said any replacements made since last September don’t need to be replaced again. Honda has been using a newer-generation Takata inflator in recall repairs, which was not affected by the supplier’s defect reports last week, Honda spokesman Chris Martin said. Honda said it could recall additional models for Takata airbags in the future if it decides to expand its passenger-side airbag recalls beyond the 13 U.S. states and territories where the current campaigns for passenger-side airbags are being conducted. “If Takata or the NHTSA later determine that a defect exists in vehicles sold or registered beyond these areas, Honda will expand this action further as required to help ensure the safety of its customers,” Martin said in a statement, noting that a nationwide expansion would affect about 1.02 million additional vehicles. BMW of North America is recalling 20 models from 2002-06 model years that contain Takata driver-side front airbag inflators. Regulators said the airbag module will be replaced. After last week's agreement between Takata and U.S. regulators, NHTSA said BMW examined its production and manufacturing records to determine the scope of affected vehicles and converted an existing national improvement campaign into a voluntary recall, increasing the number of affected vehicles to 420,661 from 140,696. Editor's note: An earlier version of this story misstated the number of vehicles Ford is adding to an existing recall of vehicles equipped with Takata airbags.